I knew it might come down to this: Build or Blog? Build or Blog? 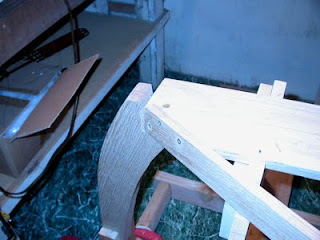 So, for the last two day's I've been building, with no time to blog. The cause for all this concentration is the hardest thing I've run into, yet: letting the chine log into the forms. Whoever said there are no straight lines, no right angles on a boat, sure was right! Well, I started off by making a 'fid' for the chine log. A fid is basically a small piece of wood that it just about the same size as the piece you need to fit, only shorter. In this case, instead of wrestling with an 8' piece of oak, I used a 3" piece. 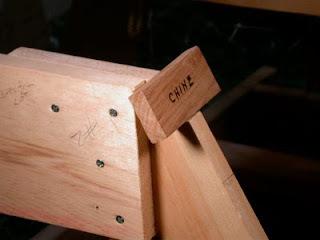 This is important, because fitting these chines is largely a matter of trial and error, until the dang thing fits. And 'dang' isn't the word that I've been using for the last two days, in case you were wondering. Note how the top edge of the fid sticks up above the bottom. This is very important! It is the *inside* top edge of the fid that must line up with the top of the form. The outside top edge of the chine log will be planed off, so it is even with the bottom. That way, the bottom planking will lie flat on the chinelog. Once I got the rough outline sketched out on the form, I carefully chiseled it out, repeatedly trying the fid in place, to see if I was getting it right. I imagine there is a more scientific way to do this... in fact, I'm almost afraid to read Greg Roselle's book right now, because I'm afraid to find a simple trick that could have saved me hours of work. Better leave that till when I'm not holding a sharp instrument. The photo below show's something important... probably the most important thing on this page: it is the *inside* top edge of the fid that must line up with the top of the form, as mentioned above. Then it was time to tackle the stem/keelson/chinelog joint. This was such a difficult job that I forgot to take photographs. I'll take more detailed pictures of this joint when I take it apart before bedding all the pieces with bedding compound. Besides, if I tried to discuss it tonight, I'd probably have a break down. 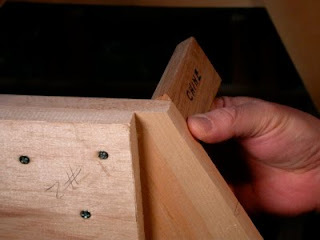 I'll just say that there isn't a single right angle in that joint... A whole bunch of odd angles that somehow come together if you have enough patience, and a nice sharp chisel. Here's what the chine log looks like before being bent into the notches on the forms. Helena and cat are occupying the Moaning Chair, to keep me working, I think! Well, more pictures than scintillating prose today, but sometimes you get to blog, and sometimes you get to build. easy woodwork and make it difficult. Don't listen to Shmuel, he/she obviously doesn't understand anything about self discovery, or the joy in building something that isn't just clicking together something that has been manufactured by others. Shmuel, if he just wanted a boat, he could have just gone out and bought one, but its the process that he's interested in. Plywood boats are basically disposable, not stronger, and basically the boat equivalent of a snaptight model. I think John is looking for something more substantial... both in his boat, and his experience. Schmuel, why do you care what he does with his time? And why do you think he should care what you think? You have to come along and pee in his Cheerios? If you've got a constructive suggestion, great. But coming along just to drop a turd and then walk away is a pretty lousy way to go through life. Thanks for your comments, guys, including you, Schmuel. My main purpose is fun, and if you enjoy feeling 'agonized', I say, keep reading! Otherwise, don't! Just remember, it's only a boat. Have fun with it! By the way, don't forget that subscribers can always unsubscribe by sending me an email with the word 'Unsubscribe' in the subject. Where are you John Almberg, I've been waiting for your next posting, I am anxious to see your progress. Sorry guys! Had to organize a bunch of stuff for my 'voyage' round Florida. Will be back to building tomorrow. This reminds me of a video I saw once of the Oxford Dangerous Sports Club. They were on the way to the top of Mt Kilamanjaro to fly off with hang gliders. None of them were glider pilots, they took a beginner's lesson just before the big leap. One of them said something to the effect that if we knew how to fly these things it wouldn't really be much of a challenge now would it. I think the blog you are posting while you learn by your mistakes is fascinating and would make a great book when you finish. 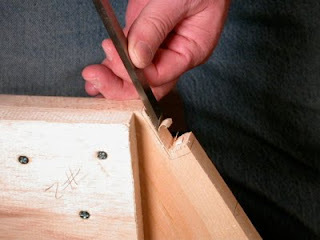 There are plenty of people who have posted excellent articles on how to build a boat but your's tells a great story of what is like for someone who is learning while doing. Keep up the good work. 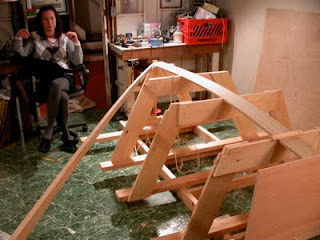 As a skilled carpenter who has never built a boat I am having a great time reading your blog. That's a really nice compliment, thanks! I'm really enjoying this build, and hope a few people think "Hey, if that nitwit can do it, I can too! ".